Anora is a 35 years old, quiet, shy woman. She has three children, two daughters and one son. Her family gets most of their income from Russia. Her husband works in Russia six months out of the year and sometime he stays there all year. 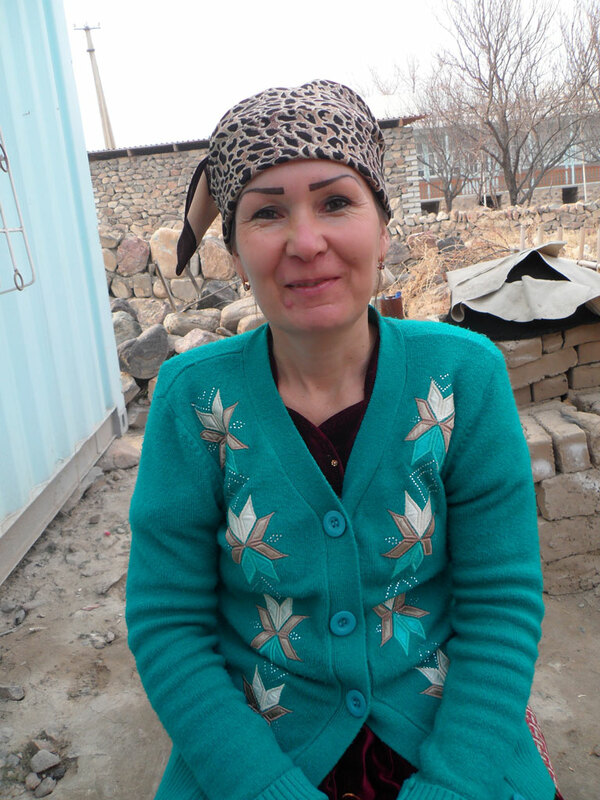 Anora grew up in a remote mountain village and could not get an education, which she regrets very much. She is the only spinner who does not know how to read and write. She likes to spin very much. She also likes to do housework. They day of her wedding was the happiest day of her life. Before her marriage she lived in the mountains and felt lonely there. Her worst day was when her brother died because of headaches. He was only 21. She and her husband want their children to get a good education and they work very hard for that. Their children study at a Gymnasium. Her oldest daughter is a very good student and Anora hopes she will become a medical doctor. Anora does not like people who are full of themselves. She likes to dance in front of her husband where she hears a nice song. She hopes to have a good, happy family – her family is most important for her. She loves and respects good people and she loves the workshop and the women she works with.